David Hockney has become the world’s most expensive living artist. His Portrait of an Artist (Pool with Two Figures) sold at Christie’s in New York last night for$90,312,500. It had been estimated at up to $80 million. After the bidding passed the $70 million mark there was a ten minute bidding battle between two rival bidders on the telephone. The previous living artist record was held by Jeff Koons whose stainless steel Balloon Dog (Orange) sold for $58 million in 2013. The Post-War and Contemporary Art Evening Sale sale attracted buyers from 33 countries across five continents and totalled $357,622,500. There were five new auction records for Hockey, Sam Gilliam (Lady Day II made $2.1 million), Pierre Soulages (Peinture 186 x 143 cm, 23 december 1959 made $10.6 million), Robert Colescott (Cultural Exchange made$912,500) and a record for a work on paper by Philip Guston (Windown $3.1 million). Major works by some of the world’s most revered and expensive artists will come under the hammer at the big November art sales in New York. 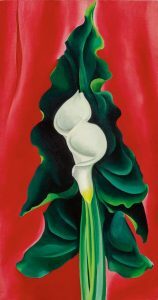 With work ranging from a major restituted masterpiece by Egon Schiele to a splash painting that promises to make David Hockney the world’s priciest living artist the sales of Impressionist and Modern and Contemporary and Post War art at Christie’s and Sotheby’s promise to create a splash of their very own. 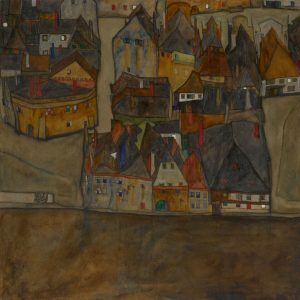 Schiele’s masterwork, City in Twilight, the small city II will highlight Sotheby’s Impressionist and Modern evening sale on November 12. Painted in 1913 it was purchased in 1928 by a young Jewish widow living in Vienna, Elsa Koditschek. The work was forcibly sold under the Nazi regime and is now offered as the resolution of a private restitution between the present owners and Elsa’s heirs. David Hockney’s Portrait of an Artist (Pool with two figures) at Christie’s Post War and Contemporary evening sale on November 15 is estimated in the region of $80 million and is poised to become the most expensive work by a living artist ever sold at auction. Highlights from the Impressionist and Modern evening sale at Christie’s on November 11 range from Claude Monet’s Effet de neige at Giverny and one of 12 extant works of Le basin aux nympheas to Picasso’s Femme au beret orange et au col de fourrure (Marie-Therese). Along with Hockney there are masterpieces by Pisarro, Rothko, Monet, Bacon and Rodin at Christie’s Post War and Contemporary evening sale on November 15. Sotheby’s say that their Impressionist and Modern sale on November 12 promises to be among the strongest and boldest in recent history. Works on offer range from a floral composition by Monet to a painterly canvas showcasing Maurice Vlaminck’s Fauve period and Miro’s monumental pastel Figure. Magritte’s painting of Edward James is one of the most important Surrealist portraits to appear at auction in decades and will feature with newly discovered works by Renoir, Morandi and Rembrandt Bugatti. The Contemporary Art evening sale at Sotheby’s on November 14 will offer works by Willem de Kooning, Frank Stella, Jeff Koons and many other leading contemporaries. With an estimate in the region of $80 million David Hockney’s Portrait of an Artist (Pool with Two Figures), 1972 is poised to become the most expensive work of art by a living artist ever sold at auction at Christie’s in New York in November. Representing a culminating apex of the artist’s two most celebrated motifs— the glistening water of a swimming pool and a double portrait – Portrait of an Artist is an immediately recognisable and iconic image in Hockney’s diverse oeuvre. It graced the covers of numerous artist monographs, starred in various exhibitions – including his traveling retrospective organised by the Tate Britain, the Centre Pompidou, and The Metropolitan Museum of Art in 2017-2018 – as well as the 1974 cult Hockney film, A Bigger Splash, the present canvas firmly stands its ground among Hockney’s most celebrated works. An often-told story of two compositions—the first destroyed over months of working and reworking, Hockney originally conceived the composition for Portrait of an Artist (Pool with Two Figures) from the accidental, almost surreal juxtaposition of two photographs on his studio floor—one of a swimmer underwater, taken in Hollywood in 1966, and the other of a boy staring at something on the ground. Intrigued by how together, the disparate clipped images made it appear as if the boy was staring at the swimmer, this double-portrait arranged by chance impelled for Hockney a substantial dramatic charge. It comes up at Christie’s evening sale of Post-War and Contemporary Art on November 15. The auction current record for David Hockney was set by Pacific Coast Highway and Santa Monica, 1990, which sold for $28,453,000 at Sotheby’s New York on May 16, 2018. The current auction record for any living artist was set by Jeff Koons’s Balloon Dog (Orange), 1994-2000, which sold for $58,405,000 at Christie’s New York on November 12, 2013. AN American landscape by David Hockney’s sold for £6 million at Sotheby’s in London on October. 5. 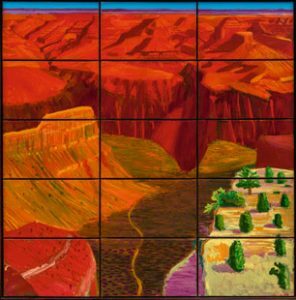 Considered one of the greatest Hockney landscapes in private hands 15 Canvas Study of the Grand Canyon (1998) was painted in preparation for A Bigger Grand Canyon, the seven and a half metre wide masterpiece housed in the National Gallery of Australia. The painting’s importance is underlined by its inclusion in two of the most important exhibitions of the artist’s career, including his major 1999 exhibition at the Centre Pompidou in Paris, and his blockbuster retrospective in London at Tate Britain earlier this year. The enthusiasm for Hockney tonight was echoed elsewhere in the sale, with a succession of strong prices for other British artists, including Cecily Brown, Hurvin Anderson, Cecily Brown, Antony Gormley and Howard Hodgkin. 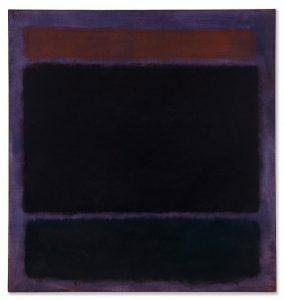 The Contemporary art evening sale brought in £18.4 million. 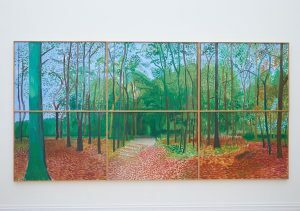 Woldgate Woods, 24, 25 and 26 October 2006, the first work from David Hockney’s famed Woldgate Woods series to appear at auction will come up at Sotheby’s contemporary art evening sale in New York on November 17. Measuring over three and half meters in diameter it is estimated at $9-12 million. With a retrospective at Tate Britain opening in February 2017 Sotheby’s reckon this could establish a record for Hockney at auction. The work captivated audiences in London at the Royal Academy blockbuster 2012 exhibition David Hockney: A Bigger Picture. Throughout 2006, Hockney executed a limited series of paintings of the Woldgate Woods in his native Yorkshire, charting the changes in light and colour as the seasons passed. Limited by the size of the canvas he was able to fit through the staircase at his Bridlington studio, he devised a method of using multiple canvases in order to achieve the desired scale. Woldgate Woods, 24, 25 and 26 October 2006, capturing the autumnal colors of East Yorkshire, is composed using six of these canvases. The huge public and critical success of this body of work has led to this quiet corner in the north east of England becoming known as ‘Hockney Country’, with the local tourist board even creating a Hockney Trail inspired by the locations immortalized in the series. Peter Doig’s The Architect’s Home in the Ravine, painted in 1991, was the top lot at Christie’s Post War and Contemporary auction in London tonight. It made £11,282,500 in a sale which brought in £58,099,000. Registered bidders from 42 countries across four continents took part in an auction where 51% of works sold above estimate and 38% were within estimate. 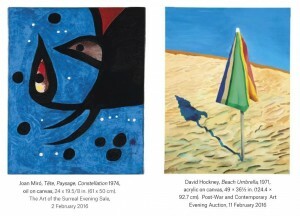 Works that were hotly contested included David Hockney’s Beach Umbrella (1971), which made £3,106,500. Three works by Alexander Calder from the Arthur and Anita Kahn Collection realised a total of £3,439,500 led by Crag with Yellow Boomerang and Red Eggplant (1974), which sold for £1,874,500. Zeitpunkt: Das Massaker von Muenchen (Point of time: The Massacre of Munich) by Joseph Beuys sold for £854,500 and Untitled (1973) by Robert Mangold, made £746,500. Each set a new world record for the artist. The Yves Klein illustrated below, estimated at £8-14 million, failed to sell. Francis Bacon’s Two Figures (1975) sold for £5.4 million. A self portrait conjoined with the figure of George Dyer it was painted in Paris shortly after Dyer’s suicide. It was from the collection of Michael Peppiatt, a leading biographer and curator of Bacon. 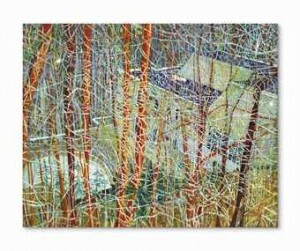 Peter Doig – The architect’s home in the ravine. 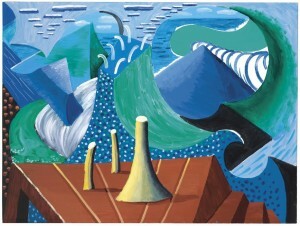 David Hockney – The Sea at Malibu, (1988) at the Post War and Contemporary sale on February 11 (£600,000-800,000). Courtesy Christie’s Images Ltd., 2016. Major British artists David Hockney and Barry Flanagan and art by Joan Miró and Andy Warhol from the Miles and Shirley Fiterman collection will feature at Christie’s sales in London in February. Eleven works will be offered at The Art of the Surreal Evening sale on February 2 and the Post-War and Contemporary Art evening auction on February 11. This follows the successful sale of work from the collection in New York in November. From Minnesota to Palm Beach, New York, and beyond, the Fitermans held a lifelong and deeply shared affinity for fine art, and built a collection that featured artistic pioneers such as Alexander Calder, Jean Dubuffet, David Hockney, Roy Lichtenstein, Joan Miró, Claes Oldenburg and Andy Warhol. Their collection was founded on not only the appreciation of scholarship and visual flair but also an understanding of the importance of establishing longstanding connections with artists.